Artist residencies Refuge or Catalyst? They are more in demand than ever – the number of applicants from home and abroad waxes. Fellowship programmes afford time, space and resources for thought, work, networking and living. The capacity, know-how and potential of Akademie Schloss Solitude, which was opened in 1990, are exemplary. This is demonstrated by the over 3,000 applications it has received for the selection round completed in 2015. This may have something to do with the completely online application, now possible for the first time, but above all it is because of the attractive conditions Joly emphasizes: defrayment of travel expenses, free lodging, fellowships lasting from three to twelve months, project funding and also the close network of former fellows. The Solitude Foundation, supported by grants from the state of Baden-Württemberg, makes available 45 studios for artists in several genres, writers, musicians, scientists and scholars. More than 1,200 fellows from 110 countries have found here not only a home away from home; they could also take part in international discourses, exhibitions and lectures. A new web portal will now better convey the Akademie’s offerings. To this end the Akademie has issued a call for an additional fellowship in digital journalism. All applicants should be no older than thirty-five years of age and have completed their degrees no longer than five years ago. The International Künstlerhaus Villa Concordia in Bamberg invites composers, writers ands visual artists who have already developed an original work for eleven-month residency fellowships. Every year the board of trustees proposes six German fellows and six fellows from another country – in 2015/16 the country is Norway. In opposition to other artists residencies there is no obligation to produce results that can be presented. The idyllic surroundings, royal palace-like atmosphere and modern supplementary buildings of Villa Concordia enable relaxed but concentrated work. Nora-Eugenie Gomringer, who became known as a slam poet, is director of the Villa, which is funded by the state of Bavaria, and organizes inspiring encounters and events that will also lastingly enliven the region. In addition to promoting artists, an important function of residency programmes is the exchange among fellows of various nationalities, cultures and media. This is true both of retreats in remote, elevating places and to institutions established in a metropolis like Berlin. There, for instance, are the Künstlerhaus Bethanien, founded in the mid-1970s, and the Berliner Künstlerprogramm of the German Academic Exchange Service, founded in 1963 exclusively for foreign artists. Many of the over one thousand invited artists have contributed to Berlin’s international reputation as a hot location for contemporary art. Not a few have even remained in the city. 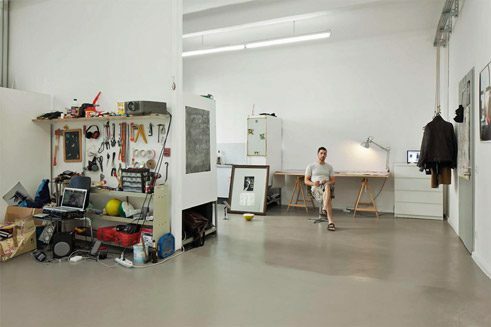 There are about forty artist residencies in Germany. In addition to temporary initiatives, they are primarily institutions financed by the federal states or municipalities and with very different programmes. The Künstlerhaus Schloss Balmoral, founded in 1995 in the tranquil spa town of Bad Ems, focuses specifically on promoting visual artists from around the world. It sets no age limit. Applicants must submit samples of their work, which are then reviewed by a jury of experts. Each year a single medium or theme takes centre stage: in 2015 it is “Dada”. This focussing brings the fellowship holders into intense conversations, says Dr. Oliver Kornhoff, who as Director of the Arp Museum Bahnhof Rolandseck is also the Artistic Director of Balmoral. Lest tranquillity and deceleration bring things to a full stop, he has built up supra-regional contacts. Balmoral has an exhibition space in the town centre and also holds closing exhibitions at the Arp Museum. For these a curator fellowship has been specially established. The more than 120-year-old listed Künstlerhaus Lukas in Ahrenshoop on the Baltic Sea awards chiefly one-month workshop scholarships, and so can be the optimum residency for artists who are bound by family or work obligations. For the European Media Artists in Residence Exchange programme of the Werkleitz Society in Halle an der Saale, one of the oldest residencies for media art productions in the world, the physical presence of the artist is unimportant. The Emare programme supports above all media art productions and the networking of various European and international institutions. Residency fellowships are sought after as never before and are becoming increasingly important: they promote not only a variety of artistic positions, but also contribute to cross-border cultural exchange. Last but not least they are a plus in every artist’s CV. Sigrun Hellmich is an art historian, journalist and writer based in Leipzig.